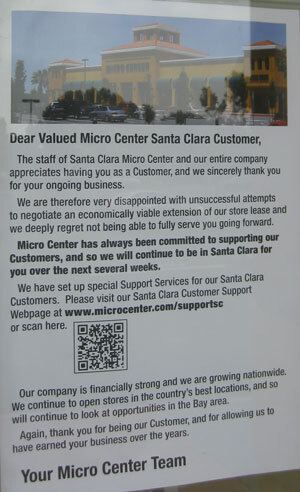 I liked Micro Center. I have liked Micro Center ever since I first visited their Denver, CO location 10 years ago. I would sometimes drive an hour in each direction just to visit that shop. I was excited to see that they had a location in the Bay Area when I moved here a few years ago (despite the preponderance of Fry’s stores). The craziest part about shopping the Santa Clara Micro Center location was the logos they displayed on the window outside. Every time I saw it, it made me sentimental for a time when some of these logos were current, or when some of these companies were still in business. Some of the logos on their front window were for companies I’ve never heard of. It reminds me of the nearby 7-11 convenience stores when I was growing up– their walls were decorated with people sporting embarrassingly 1970s styles long after the 1970s had transpired. I thought I would record what those front window logos were and try to pinpoint when the store launched exactly (assuming the logos have been their since the initial opening and never changed). Here we have Lotus, Hewlett Packard/HP, Corel, Fuji, Power Macintosh, NEC, and Fujitsu. Lotus was purchased by IBM in 1995 and still seems to be maintained as a separate brand. The Power Macintosh was introduced as a brand in 1994. Corel’s logo has seen a few mutations over the years but I don’t know when this one fell out of favor. Fuji (vs. Fujitsu) appears to refer to Fujifilm, though this logo is also obsolete. Hayes– I specifically remember reading the Slashdot post accouncing that Hayes is dead (followed by many comments reminiscing about the Hayes command set). Here is the post, from early 1999. From Googling, it doesn’t appear IBM still has a presence in the consumer computing space (though they do have something pertaining to software for consumer products). Then there’s the good old rainbow Apple logo, something that went away in 1997. I suspect 1997 was also the last hurrah of the name ‘Macintosh’ (though I remember mistakenly referring to Apple computer products as Macintoshes well into the mid-2000s and inadvertently angering some Apple enthusiasts). As for the next segment, obviously, both Sony and Toshiba are still very much alive. Iomega was acquired by EMC in 2008 but is still maintained as a separate brand. USRobotics is still around and making — what else? — 56K modems (and their current logo is slightly different than the one seen here). Targus seems to be a case maker (“Leading Provider of Cases, Bags and Accessories for Laptops and Tablets”). I wonder if that’s just their current business or if they had more areas long ago? It seems strange that they would get brand billing like this. Finally, searching for information about Practical Peripherals only produces sites about how they’re long dead (like this history lesson). It’s unclear when they died. The interior of this store was also decorated with more technology company logos near the ceiling (I didn’t really register that fact until I had visited many times). Regrettably, I now won’t be able to see how up to date those logos were. Based on the data points above, it’s safe to conclude that the store opened between 1995 or 1996 (again, assuming the logos were placed at opening and never changed). 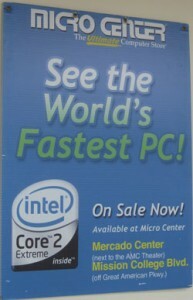 “See the world’s fastest PC!” Featuring an Intel Core 2 Extreme? That CPU dates back to 2007 and was succeeded by Nehalem in late 2008. So even that sign, which is presumably easier and cleaner to replace than the window logos, was absurdly out of date.